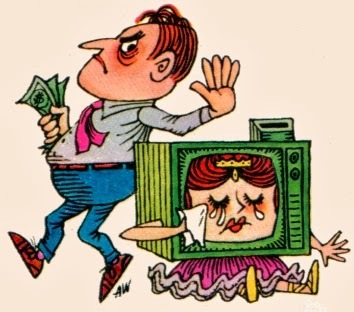 In 1965 the world's foremost authority on everything to do with television, TV Guide, turned to the experts to find out, "What Ever Happened to Pay-TV?" The answers were sobering for people in the mid-1960s who had been looking forward to the promise and variety that cable television offered. "You're probably wondering whatever happened to pay-TV. Where is it? Why hasn't the bright promise materialized? For years, you've been conditioned to beleve that 'feevee,' or 'tollvision,' or 'pay-see,' as it's called variously by its friends and enemies, will one day offer surcrease -- to hipper, more discerning minds -- from the banality of much prime-time TV programming: concerts instead of cowboys, ballet instead of bathos, opera instead of soap opera. "Well, so far it hasn't worked out that way, and a lot of experts are beginning to believe that it never will." Dr. Joseph Smith of the Oxtoby-Smith market research firm pronounced dismally, "I don't see any hope of any pay-TV system ever working." A few companies, like Zenith and RKO, had seen the potential. John F. Pinto, vice president of the RKO General Phonevision Co., was optimistic. For three years RKO had been offering pay-TV services to 5000 subscribers in Hartford, Connecticut, and insisted, "If we gave the Hartford experiment the full push, we could put it in the black in three or four years." TV Guide pointed out, though, that the facts could not be ignored. Two of the three pay-TV experiments in the U. S. and Canada had gone bust, and it wasn't looking good for RKO. They'd already spent ten million dollars, and would need 20,000 subscribers just to break even. Zenith was fighting FCC regulations that was keeping them from selling their "unscrambling device" from coast to coast. The 3 networks, ABC, NBC, and CBS felt threatened and fought hard against pay-TV in Washington. One of the networks called in the Oxtoby-Smith research firm for reassurance. Dr. Joseph Smith, the impartial researcher, who, by the way, helped design the NBC Peacock, reassured them that Americans would not be willing to spend the $65 a year it was costing to bring arts and culture into their home to replace the Hayseed shows of the day, like The Beverly Hillbillies and Gomer Pyle. Oxtoby-Smith estimated that cable companies would have to charge as much as $175 a year per household just to survive. Zenith Radio President Joseph S. Wright called that idea preposterous. He said they would be happy to get $2 a week per household, but that they could get by charging $1.25. "The economy and convenience of subscription TV is of greatest importance to middle- and lower- income families who can least afford the higher prices of entertainment." TV Guide found the most fascinating revelation of the market research to be the fact that people were far more likely to spend money on pay-TV for movies and sports than they would be for culture and educational programming. The motion picture industry already knew this and was fighting alongside the TV networks in a regulation battle to limit choices for consumers so as to preserve their monopolies over entertainment.